We offer two types of gel whitening in the practice which are Boutique and Whitewash. We only offer whitening kits which are supervised by our friendly team of dentists and therapists. 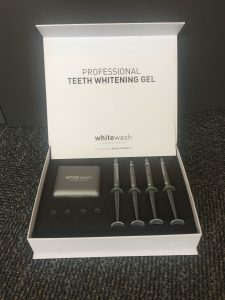 After your teeth have been assessed and have been approved for teeth whitening, impressions of your teeth will be taken to make custom-made bleaching tray. You apply a small amount of the bleaching gel to the trays every evening before you go to bed, which you then wear through the night. This process is slower and therefore more gentle for your teeth. After a month you will be seen by a dentist or therapist who will then check the status and progress of the whitening and advise further treatment.